The Farallon Islands, or Farallones, are a group of islands and rocks found in the Gulf of the Farallones, off the coast of San Francisco, California, USA. They lie 27 miles (43 km) outside the Golden Gate and 20 miles (32 km) south of Point Reyes. They are visible from the mainland on clear days. The islands are officially part of the City and County of San Francisco, California. The elephant seal population attracts a population of well-known Great White Sharks to the islands. In 1970 Farallon biologists witnessed their first shark attack, on a Steller’s sea lion. During the next fifteen years, more than one hundred attacks on seals and sea lions were observed at close range. By the year 2000, biologists were logging almost eighty attacks in a single season. No one had ever documented such behavior among great whites before. While the males return annually, the females return only every other year, often with fresh, deep bites around their heads. The seasonal population at the Farallones is a wild guess: anywhere from thirty to one hundred. The Farallones are unique in the size of the Great Whites that are attracted. The average length of a full-grown great white shark is 4 to 4.8 metres (13.3 to 15.8 ft), with a weight of 680 to 1,100 kilograms (1,500 to 2,450 lbs), females generally being larger than males. Farallon Great Whites range between the “smaller” males at 13 ft. to the females which generally range between 17-19 ft. (The largest accurately measured great white shark was a female caught in August 1988 at Prince Edward Island off the North Atlantic coast and measured 20.3 ft). Some individual sharks have been tagged and found to roam the Pacific as far as Hawaii, returning regularly to the Farallones every year in the autumn. Orcas have been seen attacking the sharks. The Farallon Islands are an important reserve protecting a huge seabird colony. The islands’ position in the highly productive California Current and Eastern Pacific upwelling region, as well as the absence of other large islands that would provide suitable nesting grounds, result in a seabird population of over 250,000. Twelve species of seabird and shorebird nest on the islands; Western Gull, Brandt’s Cormorant, Pelagic Cormorant, Double-crested Cormorant, Pigeon Guillemot, Common Murre, Cassin’s Auklet, Tufted Puffin, Black Oystercatcher, Rhinoceros Auklet, Ashy Storm-petrel, and Leach’s Storm-petrel. Since the islands were protected, Common Murres, which once numbered nearly 500,000 pairs but suffered from the egg collecting, oil spills and other disturbances which had greatly reduced their numbers, recovered and climbed from 6,000 birds to 160,000. Additionally, since protection, the locally extinct Rhinoceros Auklet has begun to breed on the islands again. The island has the world’s largest colonies of Western Gulls and Ashy Storm-petrels, the latter species being considered endangered and a conservation priority. The island also is the wintering ground of several species of migrants, and regularly attracts vagrant birds (about 400 species of bird have been recorded on or around the island). Several species of cetaceans are found near the Farallon Islands, most frequently Gray whales, Blue whales, and Humpback whales. Blue whales and Humpback whales are most frequently found near the islands in the summer and fall, when strong upwelling may support a rich pelagic food web. Grey whales are reliably found near the Farallones during their spring migration north and the fall/winter migration south. Some Grey whales may also be found during the summer, when a few whales skip the trip north to Alaska and spend the summer months off the coast of Canada and the continental U.S. In December 2005 one Humpback was rescued from netting entanglement east of the Farallons by staff of The Marine Mammal Center. The last sighting of another famous humpback, named Humphrey, was near the Farallones in 1991. The islands are in the Gulf of the Farallones National Marine Sanctuary, which protects the feeding grounds of the wildlife of the refuge. The Farallon Islands are outcroppings of the Salinian Block, a vast geologic province of granitic continental crust sharing its origins with the core of the Sierra Nevada Mountains. The block was torn off far to the south and rifted north by the San Andreas Fault which lies to the east of the islands. Other nearby examples of the Salinian Block include the Point Reyes Peninsula and Bodega Head. The islands string north westwards for 8 km. Their total land area is 0.42 km². The Territorial waters measure 247.5 km². The islands were initially exploited for bird eggs and fur seal skins, then used as a lighthouse station and a radio station. They have been protected in the Farallon National Wildlife and Wilderness Refuge, established in 1969, and contain the largest seabird colony in the U.S. outside of Alaska and Hawaii. The islands are part of the City and County of San Francisco, and are considered part of Supervisorial District One (Northwest), also called Richmond District. The islands were long known to the American Indians who lived in the Bay Area prior to the arrival of Europeans, but they are not thought to have traveled to them. The first European to record the islands was the English privateer Sir Francis Drake, who landed on the islands on 24 July 1579, in order to collect seal meat and bird eggs for his ship. He named them the Islands of Saint James, a name that survives only as the name of one of the rocky islets of the North Farallones. The islands were given the name “Farallones” (literally, “Rocks”) by Sebastián Vizcaíno, who first charted them in 1603. In the years following their discovery, the islands were exploited by seal hunters, first from New England and later from Russia. The Russians maintained a sealing station in the Farallones from 1819 to 1838, decimating the islands’ population of fur seals (it is not known whether the Northern Fur Seal or the Guadalupe Fur Seal were the islands’ native fur seal, although the Northern Fur Seal is the species that has recolonized the islands after they became protected) (White, 1995). After Alta California was ceded by Mexico to the U.S. in 1848 the islands’ environment became linked to the growth of the city of San Francisco. Beginning in 1853, a lighthouse was constructed on SEFI. As the city grew, the seabird colonies came under severe threat as eggs were collected in the millions for the markets of San Francisco. The trade, which in its heyday could yield 500,000 eggs a month, was the source of conflict between the egg collecting companies and the lighthouse keepers. This conflict turned violent in a confrontation between rival companies in 1863. The clash between two rival companies, known as the Egg War, left two men dead and marked the end of private companies on the islands, although the lighthouse keepers continued egging. This activity, combined with the threat of oil spills from shipping in San Francisco’s shipping lanes, prompted President Theodore Roosevelt to sign Executive Order No. 1043 in 1909, creating the Farallon Reservation, protecting the northern islands of the chain. This was expanded to all the islands in 1969 when it became a National Wildlife Refuge. The islands are the site of many shipwrecks, including the liberty ship SS Henry Bergh, a converted troop carrier that hit West End in 1944, pieces of which can still be seen from the island today (all hands were saved). The United States Coast Guard maintained a manned lighthouse until 1972, when it was automated. 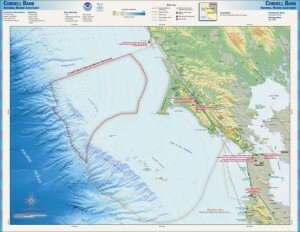 The islands are currently managed by the United States Fish and Wildlife Service, in conjunction with the Marin-based PRBO Conservation Science (formerly Point Reyes Bird Observatory – PRBO). The islands are currently the subject of long term ecological research. Today, the Farallones are closed to the public, although birders and wildlife enthusiasts can approach them on whale watching boats. For about eleven years, from 1902 to 1913, the former U.S. Weather Bureau maintained a weather station on the southeast island; a cable connected the station with the mainland. The results of the meteorology study were later published in a book on the California climate. Temperatures during those years never exceeded 90°F or dropped to 32°F. Years later, the National Weather Service provided some weather observations from the lighthouse on its local radio station. In the above map the approximate locations of two major nuclear waste dumping sites, according to a 1980 EPA report, are indicated. From 1946 to 1970, the sea around the Farallones was used as a nuclear dumping site for radioactive waste under the authority of the Atomic Energy Commission at a site known as the Farallon Island Nuclear Waste Dump. Most of the dumping took place before 1960 (in 1970, all dumping of radioactive wastes by the United States was terminated). According to a 1980 report by the Environmental Protection Agency, approximately 47,500 containers, 55 gallon steel drums, were dumped in the vicinity of the Farallones, with a total estimated radioactive activity of 14,500 Ci. All but 3,500 of these were dumped at 37°37′N 123°17′W; the rest were dumped at 37°38′N 123°08′W. The primary military agency which used the dumping site was the Naval Radiological Defense Laboratory, in San Francisco, which was charged with decontamination of the ships from the Operation Crossroads nuclear tests in 1946 and carried out additional radiological work throughout the period. The irradiated US Navy ship USS Independence, which was used as a target at Operation Crossroads, “loaded with radioactive waste from NRDL and other generators, was towed to sea and sunk,” apparently near this site. According to the United States Geological Survey, “The exact location of the containers and the potential hazard the containers pose to the environment are unknown.” The 1980 EPA report argues that attempts to remove the barrels would likely produce more of a risk to humans and the environment than simply letting them remain on the bottom of the ocean.